100 mm high Clear Plastic Heart. Box of 200pcs. Equivalent of ?1.68 each. 140 mm high Clear Plastic Heart. Box of 100pcs. Equivalent of ?2.53 each. 60 mm high Clear Plastic Heart. Box of 300pcs. Equivalent of ?0.91 each. 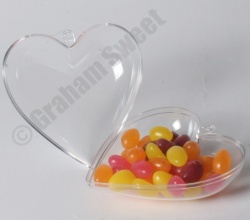 80 mm high Clear Plastic Heart. Box of 250pcs. Equivalent of ?1.31 each.